They can detect the level of liquids, even in highly conductive and sticky materials. The amplifier is mounted in an integral body, so it is ideal for mounting on small machines and equipment. Can detect the presence and remaining quantities of liquid, and liquid interfaces. Super compact, space saving type. The amplifier is mounted in a compact and integral body, so it is ideal for mounting on small machines and equipment. Wide power supply range, and low power consumption. Can be used with 8 to 28VDC. Current consumption is 30 mA or less. Can make measurements, even with material stuck on the sensor. 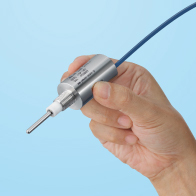 These switches can make measurements, even if the probe has conductive substances such as slurries, viscous liquids, paints, adhesives, or honey stuck on it. It meets IP67, dust-proof and water-proof specifications and can be used outdoors. With indicators showing its function. You can check whether the operation is stable or not by looking at the LEDs. * The video shows the probe eliminating the influence of material stuck on it. In addition to water, the switch can detect sticky conductive substances, such as slurries, viscous liquids, paints, adhesives, and honey.